The dawn-to-dusk Tamil Nadu bandh on on the Cauvery issue called by associations of farmers and traders passed off peacefully even as opposition leaders, including Dravida Munnetra Kazhagam's M K Stalin and Kanimozhi, courted arrest while leading protest demonstrations in various parts of the state. The day was marked by a slew of agitations, attempts to block trains and roads, by the bandh supporters, including opposition parties, across the state. Attempts to stop the Vaigai Express at Dindigul station was foiled by the police. Hundreds of protesters were held as majority of shops and business establishments across Tamil Nadu downed their shutters in support of the bandh, police said. They were protesting incidents of violence targeting Tamils in Karnataka and demanding a long-term solution to the vexed inter-state river water issue. The common man was put to inconvenience as restaurants, shops and petrol pumps remained closed till 6 pm in the state. However, the bandh did not affect functioning of state and central government offices, their undertakings, banks and PSUs though many of them witnessed thin attendance. Also, government, state-aided and most of the private schools and colleges functioned albeit with lesser turnout. State transport corporation run buses, trains plied as usual, though most autorickshaws, taxis, private trucks and commercial freight operators chose to go off the roads. Cinema shows and film shootings remained suspended during the bandh period. In Chennai, DMK Treasurer Stalin who led a rally to the Egmore Railway terminal, was detained along with hundreds of party workers when they squatted in front of the terminal attempting to launch a rail roko agitation. He told reporters that his party would support Chief Minister Jayalalithaa if she meets Prime Minister Narendra Modi or Karnataka Chief Minister Siddaramaiah over the Cauvery issue. He also accused her of "only writing letters," over the issue. 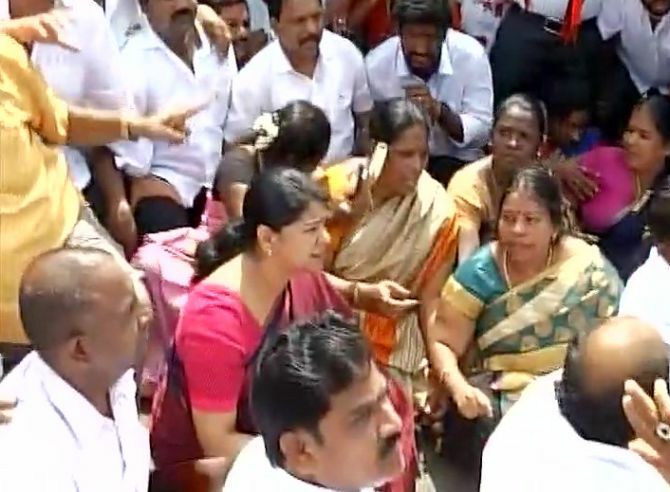 DMK Rajya Sabha MP Kanimozhi, daughter of DMK supremo M Karunanidhi, staged a road roko on arterial Anna Salai here along with party cadres and they were detained. She said the Centre cannot "keep away" from the Cauvery issue, adding efforts should have been made earlier to protect Tamil people and their properties in Karnataka. Police, who had made elaborate security arrangements deploying thousands of personnel, including about 15,000 in Chennai, in view of the bandh, later said leaders and party workers detained for holding protests were being released. Meanwhile, a youth who had set himself afire over the Cauvery issue on Thursday, succumbed to injuries. The activist of Naam Tamizhar Katchi had suffered over 90 per cent burns and died this morning at a hospital here. Marumalarchi Dravida Munnetra Kazhagam General Secretary Vaiko and Viduthalai Chiruthaigal Katchi chief Thirumavalavan staged protests in Tiruchirappalli and here respectively and were detained by police when they attempted to stage a rail blockade. "We demand the Centre to constitute Cauvery Management Board," Vaiko said, adding full quantum of water should be released according to the Cauvery Tribunal's Award. Thirumavalan condemned the large-scale violence, targeting of vehicles and destruction of properties of Tamil people in Karnataka. A stray incident of stone-pelting on a car showroom which was open was reported here. Police said that a probe was on in the matter. Meanwhile, four persons were arrested on Friday for pelting stones on an office of the IOCL on Thursday, they said. A Coimbatore report said establishments remained shut in Coimbatore, Tirupur and Nilgiris districts, affecting normal life, in response to the bandh call. In Salem, Mettupalayam, and Pollachi areas most shops were shut. About 20,000 small and medium scale units in and around the city and over 30,000 garment factories in the textile hub of Tirupur also extended support to the bandh and downed shutters. Most fireworks manufacturing units too had shut down in the industrial town of Sivakasi. In Coimbatore, senior leaders of various political parties, including DMK and MDMK and farmers associations were arrested while trying to stage rail roko near railway stations and road blockade. In the Cauvery Delta regions of Thanjavur, and Tiruchirappalli too farmers, DMK, Communist Party of India, Communist Party of India-Marxist, VCK and other party volunteers attempted rail blockade and staged protests. A report from Madurai said the bandh did not affect normalcy in southern and central districts of the state though shops, theatres, hotels and private educational institutions remained shut. Officials said no untoward incident was reported in the region. But trains were delayed at some places. They said the impact of the bandh was more in central districts than the southern districts. Karnataka-based mutts and business establishments were provided police security. The bandh evoked good response in Nagapattinam and Erode districts. Karnataka Chief Minister Siddaramaiah was burnt outside the bus terminal allegedly by some agitators while a state-run bus was stoned. Meanwhile, Kanagavalli, wife of Tamil Nadu fuel truck driver Manivelu, who was beaten up days ago allegedly by pro-Kannada activists near Chitradurga in Karnataka, reportedly told a TV channel that the state should take efforts to safely bring him back. Later, Stalin said all All India Anna Dravida Munnetra Kazhagam MPs should meet Modi and take up the Cauvery issue with him. "Else, they should resign which will be an appropriate step," he told reporters after being released by police. The Centre should also take efforts to set up the Cauvery Management Board and Regulatory Committee, he said. He thanked all the political parties and organisations which had participated in the bandh. "This bandh is a big success," he claimed.